Not much of a review this time around but more of a sharing. 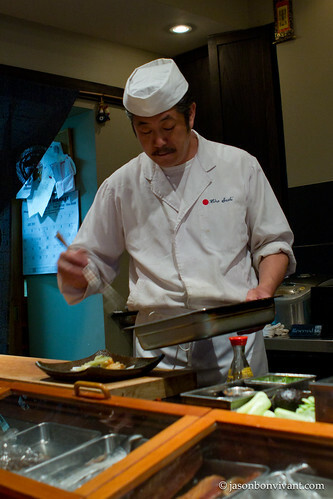 Hiro Sushi has been in business for over a decade, situated in the downtown Toronto area headed by Hiro-san himself almost every single night! His dedication and joy of being at the restaurant serving diners inspired me in re-thinking about one's dream and possibly how to achieve it with passion, patience and perseverance, the 3P which l like to call it. When young, many of us have been asked what you want to become, some wanted to become policemen, some doctors, some firemen, some bus drivers, some lawyers, some chefs and some even wanted to become rockstars. As for myself, I honestly don't remember what I wrote or if I came up with anything as a matter of fact. I strongly believe that there is nothing wrong in having a progressively developing dream(s). 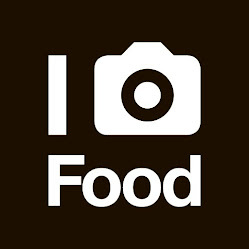 Hiro-san's passion to food has re-sparked my quest in evaluating, prioritizing ... and realizing my dream(s). Hiro-san greets and chats with his guests whenever possible, making all of them feel like home. 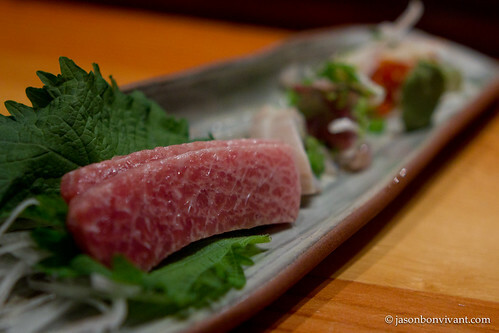 Omakase お任せ is a popular choice here because many trust Hiro-san and his recommendations. 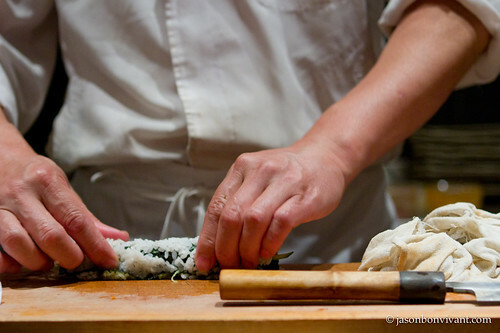 Seated at the sushi bar, watching every skillful move of Hiro-san it was truly an experience. He is not a starred chef or anything, he does not need to be to be honest and he could not care less if you ask me. He is here to provide a good time to his guests and he is happy doing so. Guests only need to relax and enjoy the meal as all meals should be. 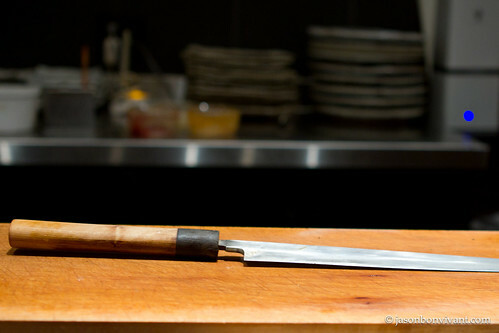 From sushi, sashimi to tempura, he handled the most crucial parts. 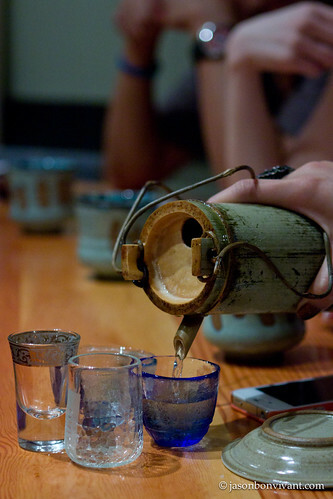 How can a Japanese meal go without sake right? Cheers! There were hits and misses yet I left there with a smile, perhaps it was the sake or the fact that I enjoyed watching Hiro-san put his culinary skills to work! It's all about the attention to details. 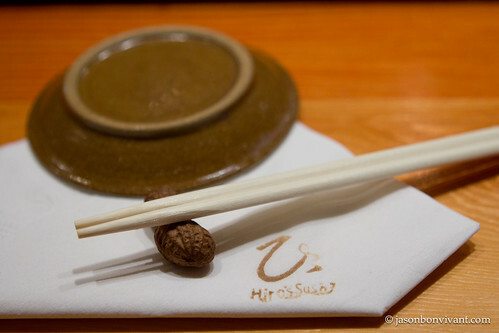 Is that a real peanut underneath the pair of chopsticks? So neat! 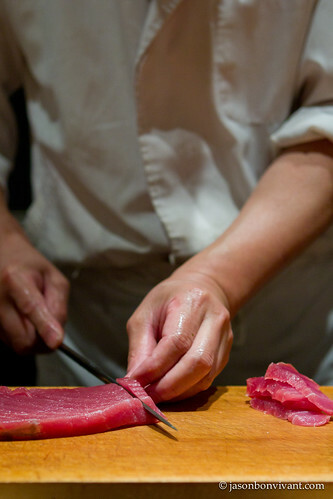 Even though there are available sushi maker now in the market, nothing can replace the goodness of traditional sushi making. Makes me crave for sushi and maki!